A 141-page consultation paper (Consultation Paper) (see archive) has been jointly published by the Financial Services and the Treasury Bureau (FSTB), the Hong Kong Monetary Authority (HKMA), the Securities and Futures Commission (SFC) and the Insurance Authority (IA). Following the recent global financial crisis, it has been recognised that the failure of financial institutions (FIs) which provided critical financial services posed systematic risk to financial stability, the real economy and society in general. To protect the stability and effective working of the financial system, many jurisdictions had no alternative but to rescue failing FIs with unprecedented amounts of public funds. This cross-departmental initiative is the Hong Kong government's response to the Group of Twenty (G20) consensus that each of its member jurisdictions needs to establish a "resolution regime" as an alternative to publicly-funded rescues. The resolution regime is intended to provide national authorities with administrative powers to bring about orderly resolution which stabilises and secures continuity for key parts of a failing FI's business, while ensuring that the costs of failure are borne by the shareholders and creditors of the failing FI. The Consultation Paper sets out the government's proposals for the establishment of a resolution regime for FIs in Hong Kong. A second stage consultation is expected during 2014, followed by the introduction of a bill to the Legislative Council in 2015. Despite the proposals set out in the Consultation Paper, some of the consultation questions are open-ended which entertain alternative proposals from the public. This newsletter will summarise the proposals and their rationale as set out in the Consultation Paper. The proposals are made with reference to The "Key Attributes of Effective Resolution Regimes for Financial Institutions" (Key Attributes) (see archive) which were endorsed by G20 leaders as a set of common standards against which the effectiveness of a resolution regime will be measured. It is proposed in the Consultation Paper to establish a single resolution regime for the FIs in Hong Kong through the passage of a single ordinance. The single resolution regime would be applicable across all financial services sectors, whilst accommodating sector-specific requirements. One advantage of establishing a single resolution regime noted in the Consultation Paper is that it could better support resolution of FIs which are part of wider financial services groups operating across multiple sectors of Hong Kong's financial system. This would also ensure a consistent approach in the resolution of FIs. A "single regime" approach is also consistent with that adopted in other major jurisdictions. Hong Kong-incorporated holding companies of FIs. In addition, the Consultation Paper also seeks initial views on whether the scope of the resolution regime should cover non-regulated operational entities on which the operation of FIs relies. The current degree of international consensus on how to implement the Key Attributes effectively in relation to FIs in each sector. it is assessed that there is no reasonable prospect that private sector or supervisory action, outside of resolution, will result in the FI once again satisfying the relevant conditions or the recognised clearing house satisfying the relevant recognition conditions or discharging the duties under the SFO, over a reasonable timeframe. the general stability and effective working of the financial system. it is assessed, by the resolution authority in Hong Kong, that the approach to resolution which the home authority proposes to adopt will deliver outcomes that are consistent with the objectives for resolution and will not disadvantage Hong Kong creditors relative to foreign creditors. the resolution of those FIs, in a manner that fulfills the objectives set for resolution, implies that resolution should be undertaken at the level of an immediate, intermediate or ultimate holding company. The resolution should promote and seek to maintain the general stability and effective working of the financial system in Hong Kong, including by securing continued provision of critical financial services, including payment, clearing and settlement functions. The resolution should seek an appropriate degree of protection for depositors, investors and policyholders. Subject to pursuing objectives 1 & 2, the resolution should seek to contain the costs of resolution and protect public funds. It is proposed in the Consultation Paper that responsibility for exercising the resolution powers under the resolution regime should be allocated to the regulators of respective financial services sectors such that the MA, SFC and IA would act as resolution authorities for FIs under their existing respective purviews. The alternative approach would be to establish a specialist agency responsible for resolution as distinct from the sector-specific regulators. The Consultation Paper sets out the pros and cons of the two approaches. Any economies of scale may be more than offset by the cost of maintaining an agency whose services are used only rarely. If, as proposed, the sectoral regulators are appointed as resolution authorities, it is proposed that arrangements will need to be made to provide for a LRA such that there is robust coordination to deal effectively with the resolution of FIs within the same financial services groups which are active in multiple sectors of the Hong Kong financial system. If, as proposed, the sectoral regulators are appointed as resolution authorities, whether one or more of the sectoral resolution authorities would act in the capacity of LRA. To facilitate effective coordination arrangements between the resolution authority and the government, it is proposed in the Consultation Paper that the resolution authority (and where relevant the LRA) should be required to consult a higher authority ahead of initiating and carrying out resolution. The Consultation Paper sets out the proposed menu of resolution options necessary under the resolution regime to secure the orderly resolution of failing FIs which are critical or systemic. In addition, the proposed resolution regime would sit alongside the existing corporate insolvency proceedings for failing FIs which do not provide critical financial services and do not pose risk to financial stability. provide suitable safeguards, particularly in cases of partial transfer, to ensure that various parties are not significantly adversely affected. It is also proposed that operational guidance for the use of this option should outline the process to be followed, and the factors to be considered, by the resolution authority with a view to ensuring that transfers only occur where the acquiring FI appears to be sufficiently sound, both financially and operationally, to take on the new business. This option refers to the transfer of some of a failing FI's business to a temporary bridge institution where it might be possible to find a third party acquirer for the business ultimately, but this cannot be arranged immediately. all of the above to be carried out without the consent of the shareholders or other affected parties, and without the need to comply with all of the otherwise applicable procedural requirements under companies or securities law, at least initially. Where it is impossible to transfer the entire business of a non-viable FI to an acquiring FI directly and the use of a bridge institution poses unacceptable risks, a statutory bail-in may be allowed. Without detailed proposals for the adoption of statutory bail-in in Hong Kong, it is broadly proposed in the Consultation Paper that the resolution authority should be allowed to write down shareholders and certain unsecured creditors, in a manner that generally respects the hierarchy of claims in liquidation and to the extent necessary to absorb losses incurred by the failing FI. It is also proposed that the resolution authority should be allowed to bail-in the liabilities of a holding company of a failing FI, with a view to ensuring that its group is adequately capitalised on a consolidated basis. In other cases, it might be appropriate to use bail-in powers to ensure that a bridge institution is adequately capitalised. Despite the above options, it is recognised in the Consultation Paper that government authorities may still be required to use public funds to rescue failing FIs in order to prevent disorderly failures. It is also recognised in the Consultation Paper that if this option is available in the resolution regime, a higher threshold for its use must be established to ensure that it is only used as a "last resort" in cases where the risks posed to financial stability are very significant yet the other resolution options could not be used to carry out resolution. The threshold for its use will be addressed in the second stage consultation. In relation to the residual parts of a failing FI, there may be situations where delivery on the objectives set for resolution may require that the residual parts of a failing FI's business be managed for a period of time until they can be sold on or wound-up over an appropriate timeframe. An example would be where there is a substantial portfolio of assets whose rapid liquidation could have a materially adverse effect on one or more financial markets. The power to reduce, including to zero, the nominal amount of shares outstanding as well as certain liabilities, and to cancel shares or debt instruments issued by an FI in resolution, and thereafter convert certain liabilities into shares. A more comprehensive list of proposed powers will be the subject of the second stage consultation. In order to prevent contractual acceleration, termination or other close-out rights (collectively known as "early termination rights"), it is proposed in the Consultation Paper that provision be made to the effect that those counterparties whose arrangements are protected and preserved in a resolution will not be able to exercise early termination rights (solely on the grounds of the resolution). On the other hand, counterparties remaining in the residual part of a failed FI will be able to exercise their early termination rights. Further, it is proposed in the Consultation Paper that the resolution authority be provided with the power to stay temporarily the early termination rights where they arise by reason only of entry into resolution or in connection with the exercise of any resolution powers. This is to prevent disorderly "race for the exit" situation during the short period of time when the resolution authority is taking an FI into resolution, and determining and communicating the form its resolution will take. It is recognised in the Consultation Paper that some FIs may be structured or operate in such a way as to create barriers to the effective use of the resolution regime when the FIs fail. Therefore, it is proposed that the resolution authority should be provided with the power to require the adoption of appropriate measures, such as changes to a FI's business practices, structure or organisation, to reduce the complexity and costliness of resolution. It is necessary that this power is exercisable well before any threat to the viability of an FI has been identified. the likely impact on the FI, including in relation to its future viability and ability to continue to provide critical financial services and thereby support the economy. More detailed proposals will be the subject of the second stage consultation. Any petition presented during this period would be stayed until the end of the period unless and until the resolution authority confirms that it has decided not to initiate resolution. In case of a partial transfer of a failing FI, notwithstanding the intention that the residual FI should be allowed to decide what would happen to the residual FI under the existing legal framework, whether provisions should be made to require the residual FI to temporarily support the business transferred to a third-party acquirer or bridge institution. Noting that the existing statutory framework does not provide for a transfer of deposits or client assets out of liquidation, whether reforms should be pursued to make this option available. It is proposed in the Consultation Paper that checks and balances should be provided for to safeguard the position of those who may be affected by resolution and to provide market participants with certainty. It is intended that the resolution regime should be given a degree of flexibility in relation to the priority of creditors in case of a resolution. 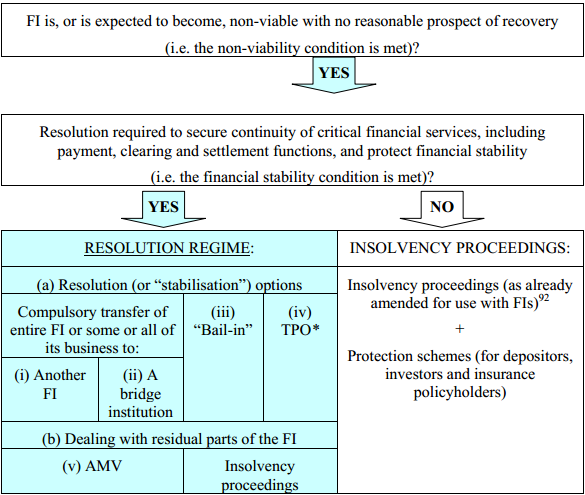 While the importance of adhering to the priority principle as would have applied under the liquidation process is recognised, it is also proposed that the resolution regime should be able to depart from the general principle of equal (pari passu) treatment of creditors of the same class where necessary to contain the potential systemic impact of a firm's failure or to maximise the value for the benefit of all creditors as a whole. It is recognised in the Consultation Paper that in some resolutions, shareholders and certain unsecured creditors could be made worse off by a particular approach to resolution as compared with liquidation. For example, where retail deposits are transferred along with higher-quality assets of an equivalent amount to another FI, the creditors remaining in the failed FI (with the lower-quality assets) in effect bear the losses which would have been shared equally among retail depositors and other unsecured creditors had the FI been liquidated in its entirety. there will be a need to consider how compensation is calculated, and in particular the difference between the dividend received in resolution and the value of the property affected absent resolution. Client assets placed with an LC or AI are currently protected by the existing framework under the SFO or the Securities and Futures (Client Securities) Rules. It is not currently proposed that changes be made to the existing framework for protecting client assets. It is recognised in the Consultation Paper that in the course of refining the proposals for the resolution regime, some adjustments may be needed to ensure that client assets can be adequately protected, and transferred if necessary, to effect resolution. It is recognised in the Consultation Paper that contractual rights and obligations which collectively constitute "financial arrangements" should be protected in case of a resolution. Rules and arrangements within trading, clearing and settlement systems. Directors and officers of a failed FI - it is proposed that they should be protected from civil liability in relation to actions taken in good faith to comply with the decisions or instructions of the resolution authority. It is noted in the Consultation Paper that it is necessary to stay any legal actions by affected parties which could impede, halt or reverse the carrying out of resolution (otherwise than because of illegality or bad faith). In order to provide legal remedies to the parties affected, it is proposed that the resolution regime should provide parties affected by resolution with a right to appeal against the decisions of the resolution authority and to be awarded compensation where appropriate. Such appeals might be made to an independent tribunal whose members may have a blend of judicial and insolvency / resolution expertise. It is recognised in the Consultation Paper that disclosures made pursuant to the SFO, the Listing Rules, the Takeovers Code or otherwise could undermine prospects for orderly resolution by damaging confidence and triggering a run on the failing FI before the resolution authority is ready to resolve it. In the Consultation Paper, it is therefore proposed that a full set of disclosure requirements and the extent to which and how best to provide temporary exemptions from them for FIs in resolution should be established. Safeguards should also be provided to directors and senior management of the FI such that they would not face regulatory or legal action for non-disclosure in good faith and at the instruction of the resolution authority. It is recognised in the Consultation Paper that in some circumstances, public funding would inevitably be required, at least temporarily, to secure an orderly resolution. Therefore, it is proposed that provisions should be made to allow recovery of losses incurred by public funds. It is also proposed that the mandate for the Hong Kong resolution authority should expressly permit and encourage cooperation with foreign counterparts on resolution matters. By doing so, it is clarified that the discretion of the Hong Kong resolution authority to act in the domestic interest is not restricted in any way in accordance with the conditions for initiating resolution domestically as set out in Part 3 of this newsletter. In the Consultation Paper, it is proposed that the powers listed below should be afforded to the resolution authority to facilitate information sharing. These powers are similar to those under the existing framework governing information sharing by the regulatory authorities in Hong Kong. Power to take into account the extent to which the jurisdiction of a potential recipient authority has comparable legal gateways permitting disclosure to the resolution authority in Hong Kong and to other authorities with resolution functions in Hong Kong. the resolution authority and its current and former officers, employees and agents will be protected against criminal and civil actions for breach of confidentiality based on their disclosure of information if the disclosure was made in accordance with the legal gateways. Interested parties are invited to submit comments on the proposals and any relevant or related matters that may have a significant impact on the proposals in the consultation paper. Question 1 Do you agree that a common framework for resolution through a single regime (albeit with some sector-specific provisions) offers advantages over establishing different regimes for FIs operating in different sectors of the financial system? If not, please explain the advantages of separate regimes and how it can be ensured that these operate together effectively in the resolution of cross-sectoral groups. Question 2 Do you agree that it is appropriate for all LBs to be within the scope of the regime (given it would only be used where a non-viable LB also posed a threat to financial stability)? If not, what other approaches to the setting of the scope of the regime, which ensure that all relevant LBs are covered, should be considered? Question 3 Do you agree that it is appropriate for all RLBs and DTCs to be within the scope of the regime (given it would only be used where a non-viable RLB or DTC posed a threat to financial stability)? If not, what other approaches, which would ensure that all relevant RLBs and DTCs are covered, should be considered? Question 4 Do you agree that it would be appropriate to extend the scope of the proposed resolution regime to FMIs which are designated to be overseen by the MA under the CSSO (other than those which are owned and operated by the MA) and those that are recognised as clearing houses under the SFO? Question 5 Do you agree that it is appropriate to set the scope of the regime to extend to some LCs? Question 6 If so, and in order to capture those LCs which could be critical or systemic, should the scope be set with reference to the regulated activities undertaken by LCs? Are the regulated activities identified in paragraph 144 those that are most relevant? Is there a case for further narrowing the scope through the use of a minimum size threshold? Question 7 Do you agree that the scope should extend to LCs which are branches or subsidiaries of G-SIFIs? Do you see a need for the scope to extend to LCs which are part of wider financial services groups, other than G-SIFIs, whether those operate only locally or cross-border? Question 8 Do you agree that it would be appropriate to extend the scope of the proposed resolution regime to the local operations of insurers designated as G-SIIs and/or IAIGs as well as those insurers which it is assessed could be critical or systemically important locally were they to fail? Question 9 Do you agree that branches of foreign FIs should be within the scope of the local resolution regime such that the powers made available might be used to: (i) facilitate resolution being undertaken by a home authority; or (ii) support local resolution? Question 10 Do you see any particular issues that need to be taken into consideration in ensuring that the regime can be deployed effectively in relation to branches of foreign FIs where necessary? Question 11 Do you agree that extending the scope of the proposed resolution regime to cover locally-incorporated holding companies is appropriate such that the powers available might be used where, and to the extent, appropriate to support resolution of one or more FIs? Question 12 Do you have any initial views on whether it is appropriate to extend the scope of the regime to affiliated operational entities to help ensure that they can continue to provide critical services to any FIs which are being resolved? Question 13 Do you agree that the conditions proposed for initiating resolution are appropriate in that they will support the use of the regime in relevant circumstances? Question 14 In particular, do you agree that it is appropriate that the first condition recognises that non-viability could arise on financial and non-financial grounds (noting that resolution could occur only if the second financial stability condition is also met)? Question 15 Are the objectives which it is proposed should be set for resolution suitable to guide the delivery of the desired outcomes? Question 16 Do you agree that, in line with their existing statutory responsibilities and supervisory intervention powers, the MA, SFC and IA should be appointed to act as resolution authorities for the FIs under their respective purviews? Question 17 Do you have any views on how a resolution option allowing compulsory transfer of all or part of a failing FI's business could most effectively be structured and used? Question 18 Do you have any views on how a resolution option allowing compulsory transfer of part of a failing FI's business to a bridge institution could most effectively be structured and used? Question 19 Do you have any views on the factors which should be taken into account in drawing up proposals for the provision of a bail-in option for the resolution regime in Hong Kong? Question 20 Do you agree that there is a case for including a TPO (temporary public ownership) option in the proposed regime? Question 21 Do you have any views on when it would be appropriate to make temporary use of an AMV in order to manage the residual parts of an FI in resolution? Question 22 Do you have any views on how best to provide for a stay of early termination rights where these might otherwise be exercisable on the grounds of an FI entering resolution or as a result of the use of certain resolution options? Question 23 Do you have any views on how best to provide the supervisory or resolution authorities with powers to require that FIs remove substantial barriers to resolution? Question 24 Is the proposed approach to ensuring that third parties cannot act to pre-empt the resolution of a non-viable FI (including by means of a petition to initiate a winding up) appropriate? Question 25 Do you have any views on how provision might be made to ensure that the residual part of an FI could be called on to temporarily support a transfer of business to another FI or bridge institution (in the manner described in paragraph 266)? Question 26 Do you attach any priority to pursuing reforms designed to ensure that the claims of protected parties (particularly those of depositors and investors) can be transferred out of liquidation proceedings, alongside those reforms being pursued to establish an effective resolution regime? Question 27 Do you agree that a compensation mechanism is a necessary safeguard to ensure that shareholders and creditors are no worse off under resolution than they would have been in liquidation? Do you have any views on the factors which should be taken into account in designing such a compensation mechanism? Question 28 Do you consider that any adjustments are needed to the existing framework for protecting client assets for the purposes of resolution? Question 29 What types of "financial arrangements" do you consider as important to protect in resolution? Why is it important that those arrangements be protected? Question 30 Do you agree that, in order to ensure resolution can be effected as swiftly as needed, there should be protection from civil liability for: (a) officers, employees and agents of the resolution authority, and (b) directors and officers of FIs acting in compliance with the instructions of the resolution authority, limited to cases where these parties are acting in good faith? Question 31 What provisions should be made under the regime to fund resolution, with a view to ensuring that any call on public funds is no more than temporary? Question 32 Do you agree that it is important that the resolution regime in Hong Kong supports, and is seen to support, cooperative and coordinated approaches to the resolution of cross-border groups given Hong Kong's status as a major financial centre playing host to a significant number of global financial services groups? Question 33 Do you agree that the model outlined in paragraphs 331 to 333 to support and give effect to resolution actions being carried out by a foreign home resolution authority would be effective in supporting coordinated approaches to resolution where it is in the interests of Hong Kong to do so? Question 34 Do you consider that the powers proposed regarding information sharing strike an appropriate balance in terms of facilitating information sharing for resolution in both in a domestic and cross-border context whilst also ensuring that all reasonable steps are taken to preserve confidentiality?